Can I tell you how excited I am about my ‘new’ wall? 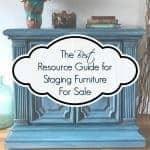 We have been knee deep in a living room makeover project. We have removed and replaced just about everything except the children! 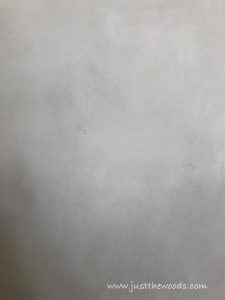 I decided that I want a cloudy finish accent wall. 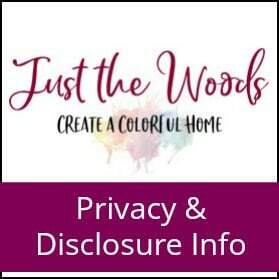 Disclosure: This painted wall with fresco lime paint post contains affiliate links. Here is my ‘ before’ photo of my normal wall. 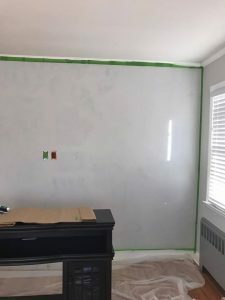 Actually, the wall was a dark sage green to start and was not initially going to be the accent wall. 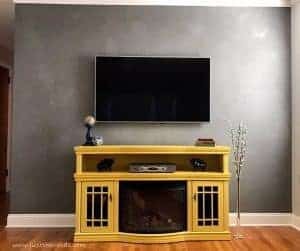 After starting to paint the room we made a few changes to the plan and decided that we would move the television from one wall to this wall and make this the cloudy accent wall. 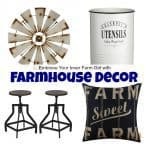 I was lucky enough to win $250 worth of paint products from Pure & Original from participating in the Fab Furniture Flippin Contest. 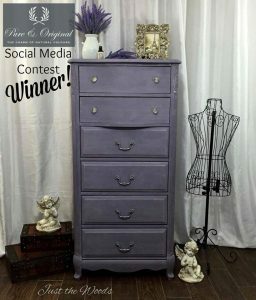 My lavender lingerie chest was the Social Media Contest Winner! You can see that lingerie chest post here – Lovely Lavender Lingerie Chest. 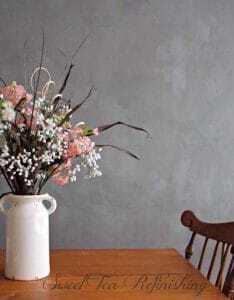 I was inspired by my friend Thea from That Sweet Tea Life and her wall that she painted using Fresco Lime Paint. 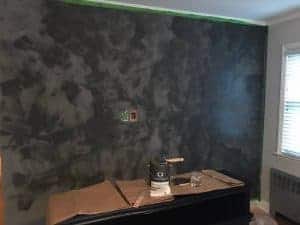 This is her wall, how could you not fall in love with this finish? 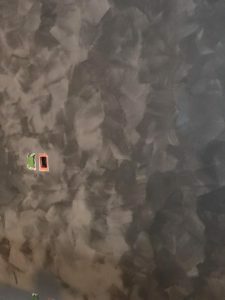 Since we are redesigning the living room using shades of grays (among other colors) I decided that Tin Kettle is the perfect color for our home as well. I contacted Pure & Original and had them send me out the tinted wall prim, Fresco Tin Kettle and the fancy wall brush. 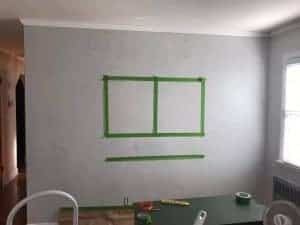 The wall was then taped off with my green frog tape and a drop cloth was put on the floor. We didn’t bother with a drop cloth when painting the rest of the walls, and I learned my lesson from that. Crawling around on all fours with a flat razor and baby wipe, then again with rubbing alcohol and a paper towel is not something I consider fun. Hindsight! 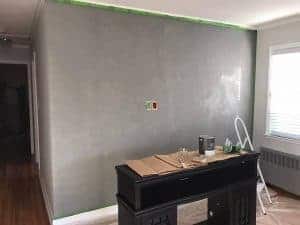 The tinted wall prim goes on first and acts as a base coat to prime the wall. I was able to use a small roller for this step. The wall prim also works best when you add a little water to it. I only used one coat of wall prim since I went with the tinted base which helps make things go a little faster. After waiting for the wall to be completely dry I was able to move on to the fun part and break out that chunky paint brush. Luckily the dry time was rather quick since I’m not battling any humidity in January. I added water to the tin kettle fresco as well and mixed it well before starting. Using the wall brush I worked fast while the fresco lime paint was wet and painted the wall using uneven brush strokes. I basically painted all willy-nilly in each and every direction. 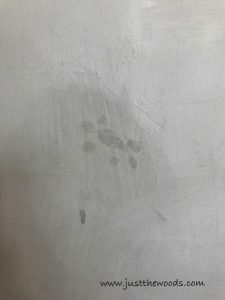 This photo shows a good example of the brush strokes while the paint was still wet on the wall. The paint does dry rather quickly, so you have to keep going once you’ve started. You can see how the brush strokes are going in every direction. While still wet you can actually see up close the lime crystals in the paint! 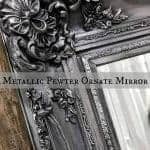 Once fully dry you are left with a cloudy, matte gorgeous finish. I did apply two coats of Fresco to the wall, and lightly sanded any imperfections in between. There were a few spots where I had the brush a little too wet and had drip marks or another spot where a bristle from the brush came out onto the wall. These spots were easily erased with a little sandpaper and were completely user error. I admit that I am completely in love with the end result and my newly finished media stand looks amazing on the gray cloudy wall! 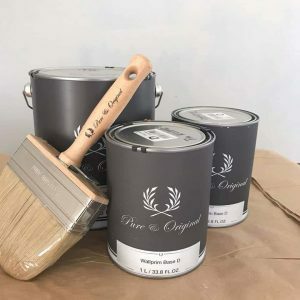 If you are interested in Pure & Originals Fresco Lime Paint, you can check out the info and details on their website HERE. My daughter decided to throw one of those darn sticky lizard toys in my pretty wall. You know those toys that the kids get at the dollar store, Im not even sure how this thing made it into my house! She came up to me nervous and quiet to say “um, Mommy, I put the lizard on the wall and it made a mark” to which I replied “which wall Layla?” .. “um the gray wall mom”. 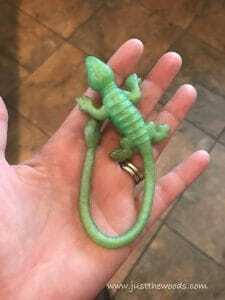 So, as I jumped up I already knew what wall she meant, and yup, of all the walls in the house, she stuck that stupid lizard to my pretty fresco lime wall! That darn spot even shows the stupid lizard feet. I haven’t had my morning coffee yet, so my head started to spin and smoke came out of my ears. I sent Layla to her room, and without thinking grabbed a damp paper towel. NOPE, that didn’t help at all. 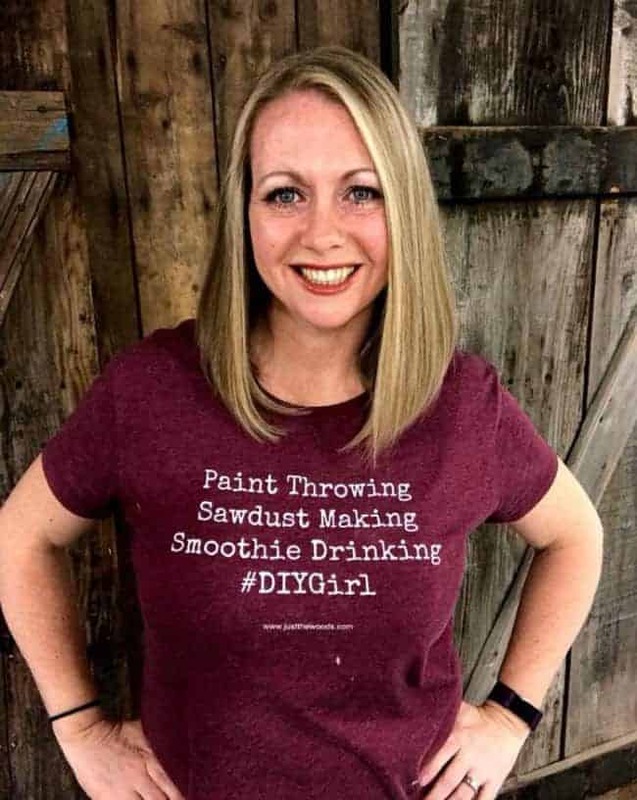 So I reached out to my friend Thea to talk me down before I started to repaint the wall in a frenzy of panic and she suggested sandpaper. ahhhh yes. A quick light sanding with 320 grit sandpaper and my wall is saved. It’s safe to let my little one out of her room, and I can have coffee now. All this before 8am? Someone send more coffee! That turned out amazing. 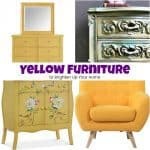 And that yellow… it stands out so well against the wall! I love the effect of the accent wall. It makes me think of galvanized metal. And I love the pop of color against the wall. 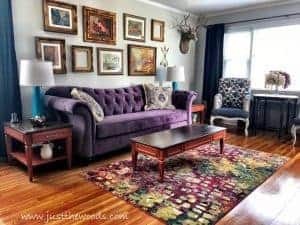 I’m over the moon SMITTEN over this space, Kandice. 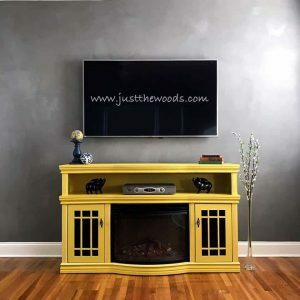 I mean, the wall is drop dead gorgeous, but so is that TV console… gah. Big box media stand kinda stores have NOTHING on you! thank you so much!! 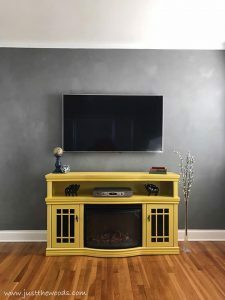 And to think I almost didnt paint the media console, So glad I decided to keep and paint it. 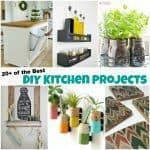 Thank you so much for the feature!! OMG, I am dying over the lizard print! I got in trouble when I was little for tossing one of the sticky hand versions on to the ceiling…same thing weird oily mark. Oh, Layla!